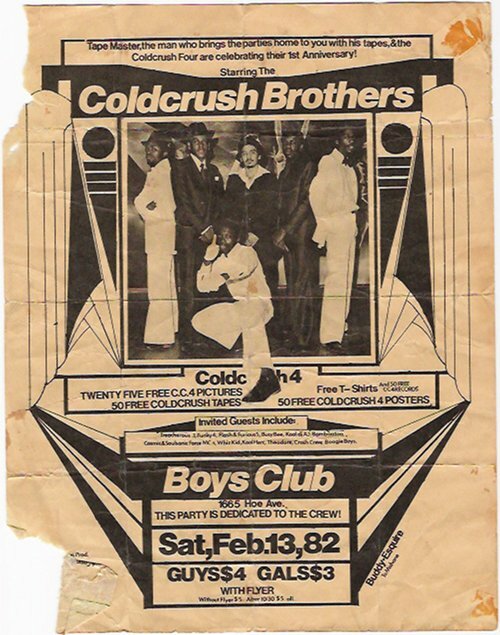 Back in the days, flyers were the thing to do to get the word out about jams and battles, or how Troy L Smith says: “They were the visual manifestation of the block’s word-of-mouth”. 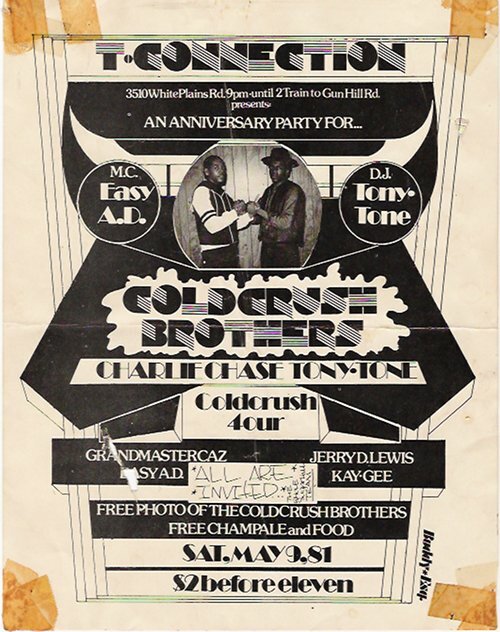 Buddy Esquire aka “The King of Flyers” was one of a handfull of people who designed well over 300 flyer at the beginning of hip-hop’s history and each of them got printed more than a thousand times. One of the other most known people drawing flyers at that time was Phase 2. I just stumbled over this page which has more than a hundred of flyers up from back in the days in high quality all done by Buddy Esquire and Phase 2. Troy L. Smith did a pretty long interview with “The King of Flyer” and it’s really worth giving it a read. In the interview you’ll learn that Buddy started out with graffiti in 1972 and kept it up until the early 1980s. 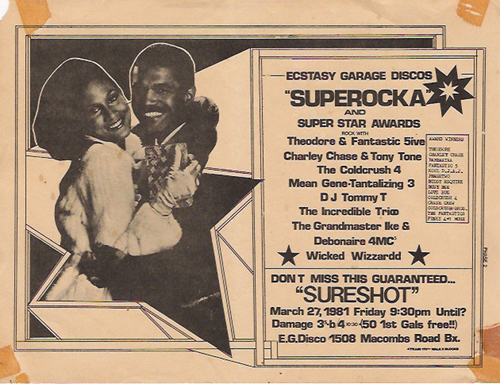 He did his first flyer for a block party in 1977. During that time he also made himself known in painting peoples cloths. For his flyers, though, he deliberately wanted to get away from graffiti influenced styles and prefered the clean cut logo of Maxwell Tapes as inspiration. As he had no education in Arts or Design he taught himself lettertype, proportions and lay out by getting books about fine painting from the libary. His step-by-step explanation of how he did flyers back then goes roughly like this: First he would select letters and their size and where he wanted to place them on the flyer and would all do this on one piece of paper. On another paper he would draw the background. “I would take the letters and I would cut them out”, he tells Troy in the interview, “and I would take a ruler and measure them and I would then glue them on the piece of paper where I would want them. Once everything was glued down on the paper I would then draw the back ground around the letters”. This took him around 6 hours. The next step would be to give the flyer to the promoter to get it printed. Around 1982 Buddy changed his style trying out more asymmetrical designs where he would for example balance out the text on the right hand side of the flyer with a photo on the left hand side (as you see above). That meant “whatever is on one side is not going to necessarily be on the other side, it could be something totally different”, Buddy explains Troy. 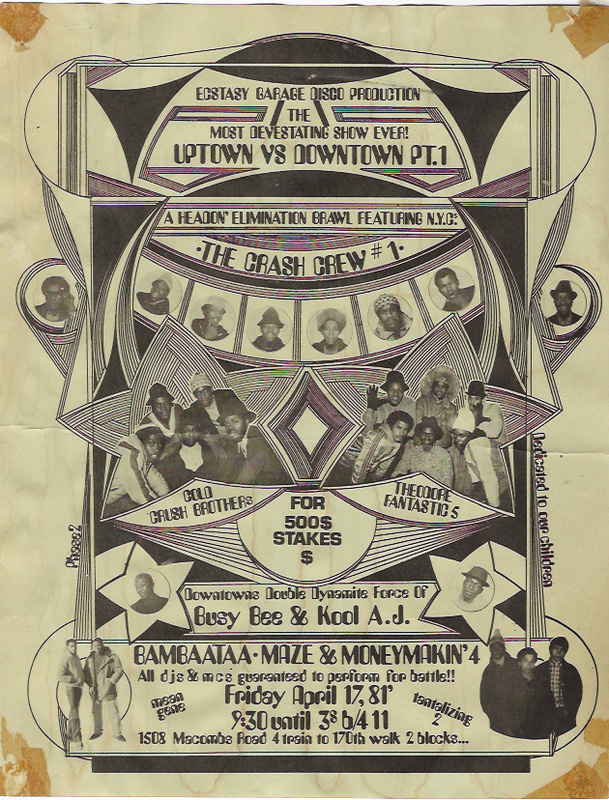 The flyers Buddy has created for hip hop jams from 1978-1985 have been featured in the books “Born in the Bronx. A Visual Record of the Early Days of Hip Hop” and “Yes Yes Y’all: the Experience Music Project Oral History of hHip-Hop’s First Decade” aswell as in Wax Poetics Issue 17.